Learning the nuts and bolts of why some wines taste good, better and best with some foods is fun. More fun when your team is Gina Bettancourt, Kim Giuliano and me! We wanted to pick a food that would challenge us to use our learnings to find a synergistic match. It also had to be a Hot First Course as well as be easy to transport and serve with limited kitchen space. We made a change in serving format to accommodate a smaller tasting portion. Since tomatoes are not in season we used canned San Marzano tomatoes. We also tried to adapt the recipe to substitute parsley for basil to make it easier to pair, however we all preferred the sophistication of the basil. The components and ingredients of this dish proved to be challenging but we learned a lot in the process. The tomatoes are sweet and high in acid so could pair well with bright reds such as a Barolo, Rosso or Barbaresco. It could go with a crisp Pinot Grigio. The creamy panna cotta would go well with a white wine with good acidity to cut through the richness of the cream. The challenge was to find something that would pair with both elements when they are combined into one dish. We anticipated dealing with two textures, a shifting flavor profile and both vegetable and animal fats. All in all, we felt we would learn the most from starting with a difficult dish. Once we decided on a dish to serve, we started the search for a wine that would be a synergistic match. We thought it best to try a large selection of all the possibilities and get advice from many different sources. Kim was passionate about selecting Italian wines and Italian varieties vinified locally. She focused on finding some high acid Italian whites which included Pinot Grigio. She also found some Barberas, both Italian and a local favorite. 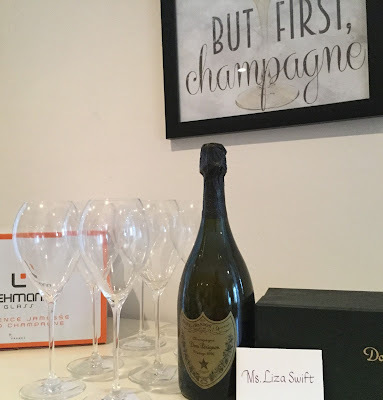 She researched pairing suggestions by asking friends and wine clubs as well as getting advice from information published by various sources including cruise lines that do food and wine pairing on cruises to Italy. Gina sourced some unoaked chardonnay as well as looked for interesting high QPR wines. She determined a wine based on Port varieties might balance both the acid and warm climate fruit character. As well, she was looking for affordable every day wines to go with the everyday nature of tomato soup. 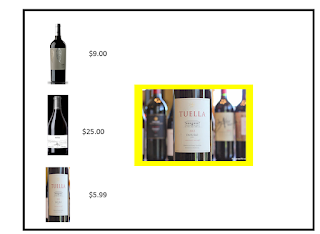 I researched pairing and got advice from several local wine shops as well as a somm at Ella’s, a restaurant which is featuring San Marzano tomato based soup. 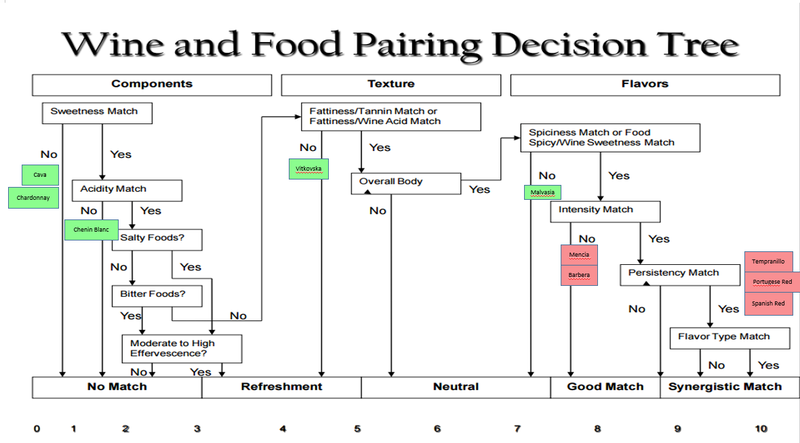 Initial recommendations highly favored Old World white wine with strong acid profiles. Focusing on interesting exotic varieties like Mencia, Vitkovska, I looked for wines from the Old World, especially Spain and Friuli. In the end, we tasted through 27 wines. Two were flawed. We selected a Top 10 and walked those favorites through pairing with the soup. We initially thought a white wine would go best. Research and advice from experts pointed towards high acid whites. However, the Cava and the Chardonnay were steamrollered by the sweetness in the food. We moved to the Chenin Blanc thinking that the fruitiness would carry this wine, but the acidity in the food overpowered the wine, leaving a white that initially tasted brisk and inviting, flat and thin. The Kante Vitkovska is a lovely wine. When we tasted it alone, it seemed like such a good match intellectually, we almost went for the soup right then and there. Unfortunately, the creaminess of the panna cotta flattened it and resulted in a no match. And so all the white wines were eliminated. 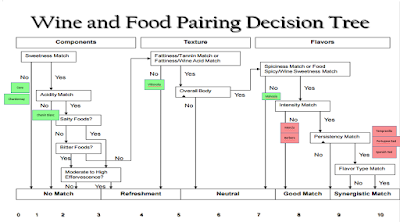 Moving on to the reds, we found they all conquered the decision tree and landed to the right of good match. So we were able to move forward toward synergy. The Barbera proved too intense. The wine overpowered the soup. The Mencia was gentler in its letdown. It was in the persistency phase where we realized the delicious wine never got to that harmonious gelling with the tasty soup. The Spanish Blend was third. Laya, a young red from the Almansa region of Spain is comprised of 70% garnacha tintorera and 30 % monastrell. It saw 4 months of aging in new French oak. The resulting silky wine laden with black and red fruits with a solid backbone of acid made a better than good match. The touch of herbaceousness went well with the undercurrent of basil in the soup. The Hito from Cepa 21, a line of Bodegas Emilio Moro, came in second. 100% Tinto Fino, this Ribera Del Duero offering saw 8 mos. in French Oak. It had a brightness in color and flavor along with persistency, elegance and delicious, well integrated fruit character. Texturally, it had the tannins to stand up to the soup as well as the creamy panna cotta and was a close contender for synergy.